Duane syndrome (DS), also commonly referred to as Duane retraction syndrome (DRS), is an eye movement disorder (a form of strabismus) that is present at birth due to the abnormal development of the 6thcranial nerve. The 6thcranial nerve controls the lateral rectus muscle, which is responsible for the lateral movement of the eyeball (especially outward). When an individual has DS, he or she experiences difficulty rotating one or both eyes outward or inward. Currently, there is no known cure for Duane syndrome; however, there are treatment options available to patients to relieve symptoms and help them live normal, productive lives. At Vision for Life, we have successfully utilized syntonics and vision therapy to treat individuals with Duane syndrome. Syntonics is a form of light therapy that can alleviate vision problems. It consists of the patient wearing colored filtered goggles. While a treatment plan varies from patient to patient, typically the goggles are worn for approximately 10 minutes or less. This treatment is repeated through a number of sessions. The number of sessions and the color of the filter of the goggles are all based on the individual patient’s symptoms. For example, a patient whose eyes turn in would most likely view a different color than a patient whose eyes turn out. To learn more about this therapy technique, CLICK HERE. Syntonic therapy is often used in conjunction with our other vision activities. We have a variety of eye exercises that help the patient’s eyes align and work together as a team. The vision therapy activities that we assign the patient are based on his or her age and the severity of Duane syndrome. It is important that patients and/or their parents are aware that these treatment options are available to them, and that they do not have to undergo surgery as treatment. Surgery is merely a cosmetic fix, and will not be as successful as syntonics or vision therapy in restoring alignment of the eyes. Also, surgery has a variety of risks for the patient and his or her sight. At Vision for Life, we always encourage patients to avoid surgery and to undergo our non-invasive, safe treatment options. 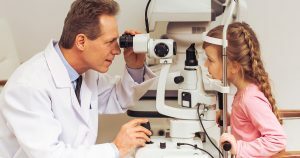 If you or your child has Duane syndrome, call us at 618-288-1489 to schedule a complete vision evaluation. We will develop a custom treatment plan for you to yield the most effective results. While there is no cure to Duane syndrome at this time, our team has successfully treated countless individuals, helping alleviate their symptoms so that they can live happy, healthy lives. Don’t wait. Contact us today, and let us help you lead your best life.